Affiliates BuddyPress is an Affiliates integration with BuddyPress that allows to display affiliate content in the BuddyPress user profile – both plugins are required to make sensible use of this integration. You would use this plugin to display the page content of a specific page intended to be seen by affiliates, or by potential affiliates who would like to sign up, and have it integrated within the user profile section that BuddyPress provides. Setting the integration up is pretty straight-forward, you simply need to specify which page will be used to provide the content shown. Obviously, you need to have BuddyPress installed and the Affiliates plugin (alternatively Affiliates Pro or Affiliates Enterprise). Go to your WordPress dashboard and under Affiliates > BuddyPress select the page that should provide the content to be shown to affiliates or potential affiliates in the user profile section. The plugin will add a new entry to the BuddyPress profile menu where the content of the selected page is embedded. It’s recommended to generate the default affiliate area and use that page, this generic affiliate area is sufficient for many deployments. 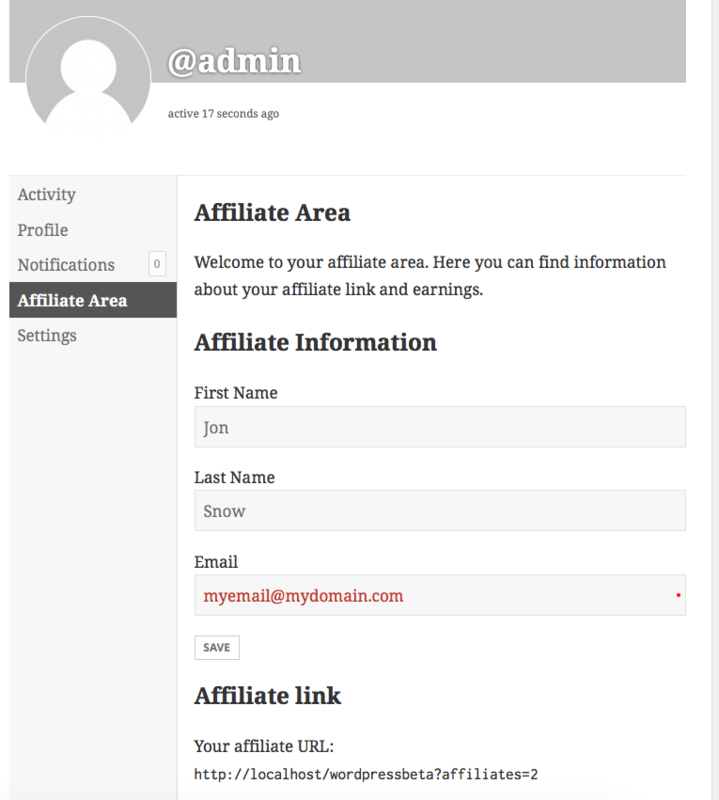 Please refer to the Pages section in the documentation of the Affiliates plugin for details. Then go to Affiliates > BuddyPress and select the page in the dropdown provided there and hit the Save button. Now visit the front end user profile pages provided by BuddyPress and you should see there is a new entry named after the title of the selected page. 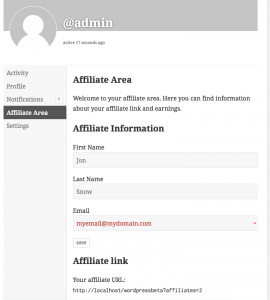 If you have chosen to use the default affiliate area, then this allows non-affiliates to join the affiliate program. Those that have already signed up, will see their affiliate resources and stats there. Go to Plugins > Add New > Upload Plugin to upload the zip file, then activate the plugin.